"The section about greenhouse gases because I've heard the term used a lot before, but never really knew what it meant." "How mass plays into the atmospheric density and the releasing of greenhouse gases of a planet. 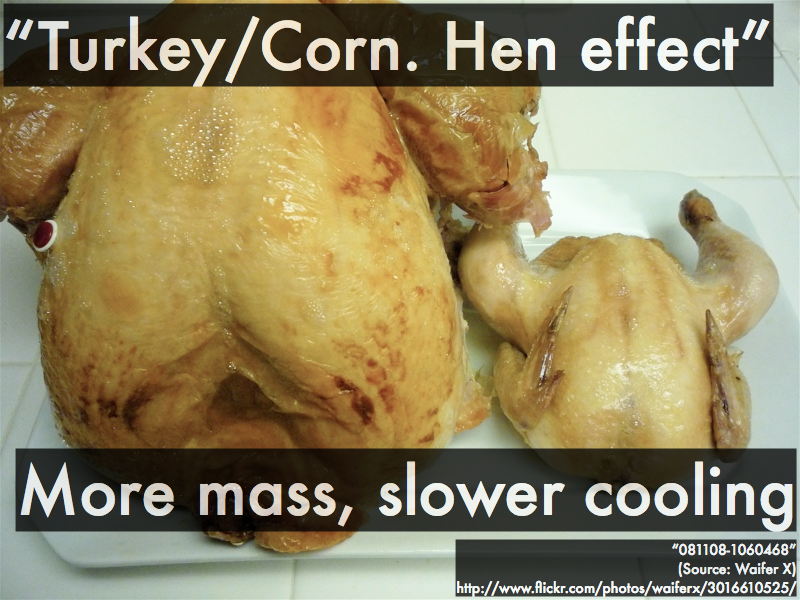 I also remembered when reading the section on temperature and distance from the sun/size, the example from class about the turkey and the cornish hen effect. This is what honestly made it interesting--your anecdote!" "How studying the greenhouse effect of other planets can provide some insight into our own planet." "I find it very interesting and alarming that the greenhouse gas cycles of planets go awry for different reasons. 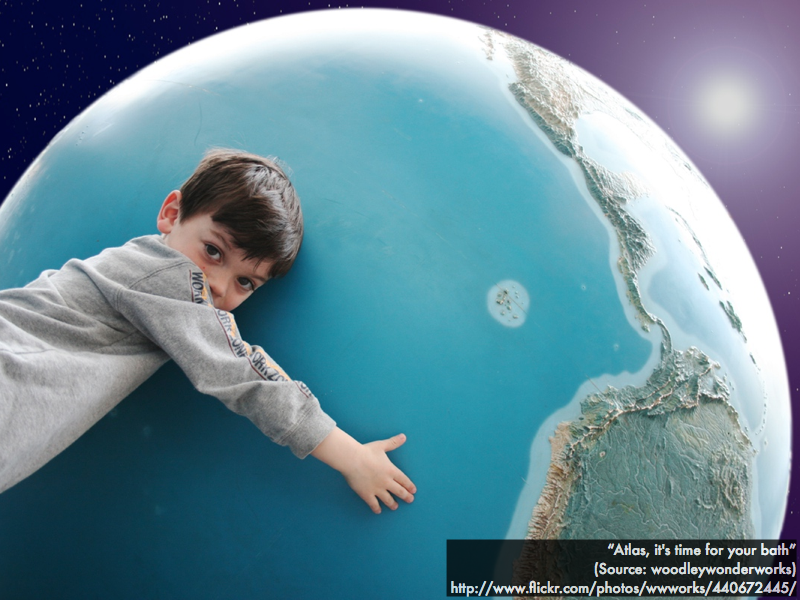 What happens if it happens to Earth?" "How similar Venus and Earth were, but how the difference in distance from the sun made them so different." "I was kind of blown away to find out that we've landed space probes on Venus. I didn't think anything could survive that!" "How Venus and Mars have had problems with their greenhouse gas cycles (runaway greenhouse effect) especially because that is a problem we are having on Earth right now. Could it be inevitable?" "I find it interesting that Mars once had a different climate that permitted water. I know that Earth changes, but when I think of other planets I just never really thought about how their climates and surfaces/atmos' might have changed. It also made me a little sad when the textbook stated at the end of the chapter: 'Mars is now a cold, dry world.'" "I've known about scientists finding evidence of water on Mars before, but I had no idea of the scope of it. The textbook mentions the term 'outflow channels,' which were valleys cut away by massive floods that apparently carried around 10,000 times the volume of water from Earth's Mississippi River. I find it interesting because how much water could possibly be underground and maybe the original Total Recall movie had a pretty good idea going for them." "I was intrigued about the possibility of oceans and earth-like atmospheres on the 'runaway' planets. Curious as to whether or not scientific advancements could cause one of them to replicate a life-sustaining environment." "How jovian planets get their weather mostly from their core heat. Earth's weather is dependent on solar heat, evaporating water, causing rain, etc., etc. It's very 'out-in,' But jovian planets have a weather that's more 'in-out.'" "That the surfaces of the jovian worlds were made of gas and therefore unable to be walked on." "How to tell if something is actually classified as a planet. I thought it was a much complicated process than the IAU's three questions." 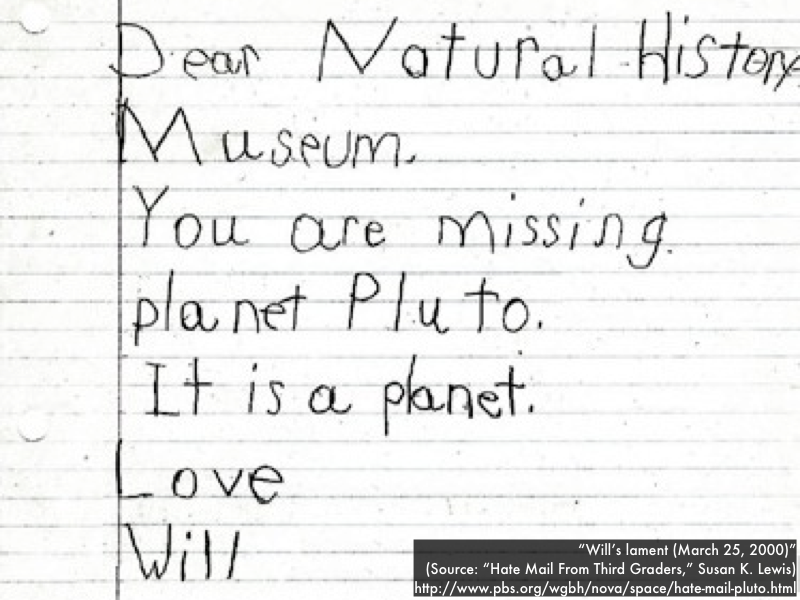 "I really appreciated the explanation for Pluto's updated status as a dwarf planet. I remember learning about the change when I was very young, and being so confused." 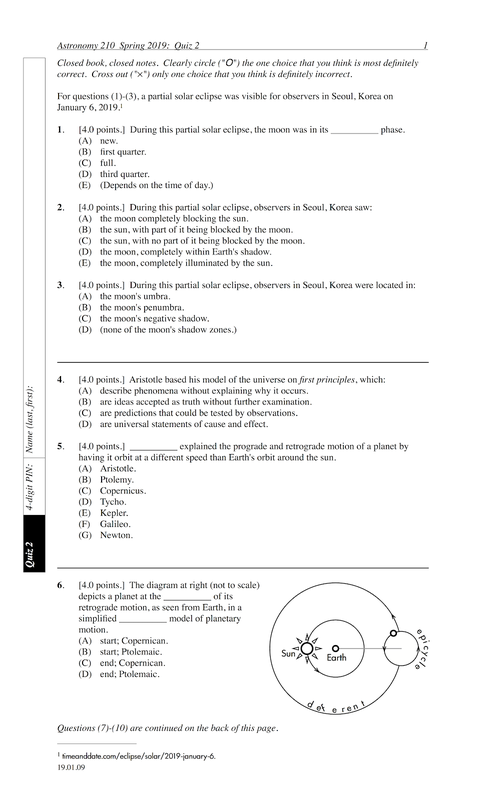 "To learn about the three questions that can be asked to classify whether or not an object is a planet. I never really knew what the qualifications were, and I was curious as to why Pluto was demoted." "The way they choose to classify planets--we only have so much information and it changes a lot but they figured out a nice basic system to classify things with." "The reasoning behind Pluto no longer a planet. After reading why, it makes more sense that Pluto is better defined as a dwarf planet." "The runaway greenhouse model for Venus; I didn't really understand what 'stronger greenhouse effect' meant." "Just a brief explanation on the surface of Mars and how some areas are younger and how it had water." "I'd like to go more in-depth on the atmospheres of each planet." "How volcanic activity is affected by the crust and its relationship with how a planet develops is a bit hard to understand." "I think the greenhouse effect is something that I'm going to need to take some time to understand. I think I'll be able to get it, but I just need to think on it a bit longer. It's just confusing to keep everything straight in my head." "Why every planet is so different." "How Mars had flowing water at one point and now it doesn't. I just don't understand what caused the water to freeze." "The IAU rules and classes were a bit confusing. While I could guess which depicted planetesimal was actually considered a planet, I could not truly tell the difference." "A little confused on what classifies a planet." "After the explanation of dwarf planets, Pluto is more similar to Eris and Ceres. Also Pluto is like Kuiper belt objects that are caught in orbital resonance with Neptune." "I really want Pluto to be considered a planet. As silly as it seems kicking Pluto out is so rude. When I see the criteria for what makes something a planet it makes sense why Pluto would be more of a dwarf planet." "Pluto isn't classified as a planet (though I wish it was) because it does not dominate its orbit." "I cannot quite make out from the presentation whether or not Pluto is a planet. However, Pluto seems to rotate the sun, retains a spherical form, and appears to have a dominant orbit." "Well, the states that one part of the criteria to be a planet in the Jovian system is that it needs to be 'large enough to dominate and gravitationally clear its orbital region of most other objects.' This is one reason why Pluto can't be one of us...it's just too puny." "Why make Pluto a planet then kick him out; that's just rude." "As much as I wish Pluto was a planet, Pluto isn't large enough 'to dominate and gravitation-ally clear its orbital region, or all, other objects.'" "On one hand it orbits the sun and has moons and geological activity like other planets, but on the other hand it is so small and resembles many other 'dwarf planets' of a similar type. I think calling them dwarf planets is a happy medium." "Pluto is not considered a planet because it is in the Kuiper Belt. Pluto also doesn't meet one of the IAU's criteria which is being able to be large enough to dominate/gravitationally clear its orbital region. In my <3 Pluto is still a planet though (I remember your bit about the legal drinking age. but I dont care. long live Pluto.)" "I understand that by scientific qualifications that Pluto doesn't make the standard, but I suppose I have some nostalgic fondness for when Pluto used to be considered a planet when I was a kid." "It has moons, and it is also young. Over time I think it will develop." "Because I grew up with it a planet and when it changed I got really upset." "Pluto has four more moons than Earth, it should be a planet." "This isn't a joke. If you gain a place in a sports hall of fame, you can't be taken out. It's like the states. We've had civil wars over this kind of stuff. Once a state, always a state. Donald Trump still has a star on the boardwalk. We are better than this. Little people are still considered people. Pluto will always be a (dwarf) planet." "From what I can tell it looks round, it orbits the sun, but I don't know if it dominates it's orbit so that's why I agree rather than strongly agree." "I do not have more authority then established, professional astronomers to make that decision based on opinion and nostalgia." "Mike Brown ("The Man Who Killed Pluto") spoke at an event that I was at for my old job. He convinced me!" "On one hand I was used to Pluto being a planet. But i understand that due to its size and the discovery of larger planets farther out, in comparison that it just doesn't fit the qualities that we used to define a planet anymore. But at least they still call it a dwarf planet." "I see both sides to the argument and just don't care either way." "I don't believe it should be a planet because it isnt big enough to clear its orbital path. If it were considered a planet then shouldnt all of the other similar dwarf planets have to be considered planets as well?" "It is not a planet because it does not dominate its orbit. The dwarf planet isn't able to bring in and project objects in and out of its orbit." 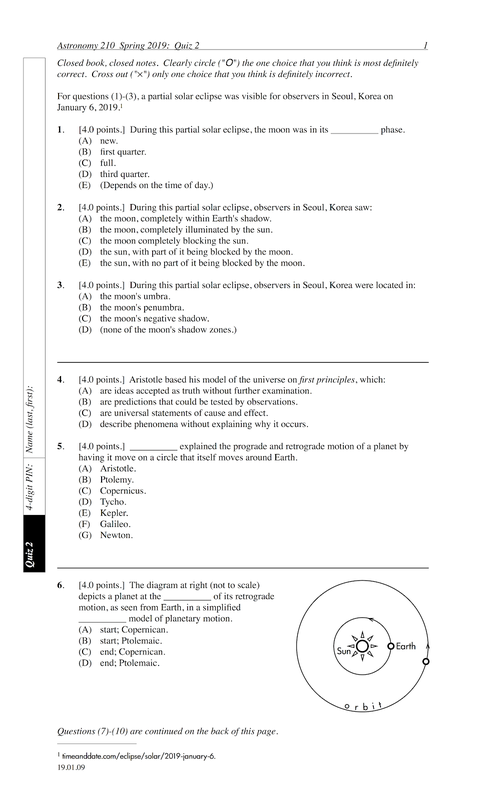 "According to the International Astronomical Union it passes the three questions so it should be a planet." "I can see it going either way. Pluto does orbit the sun, but is shaped differently from traditional planets." "I'm not much for nostalgia. Bye, Pluto." "More educated and informed people than me should be the ones to make this decision." "One less to learn about." "According to the three questions asked for Pluto to be considered a planet, it doesn't appear to be so. Pluto does not appear to be completely round or be big enough to dominate orbit. I'd say no..."
"It is still circulating in our solar system but it does not meet the IAU's standards for what a planet is so I am neutral." "I grew up when Pluto was a planet but I guess they decided that Pluto is not worthy of being a planet. I don't know much about it so I can't really argue against it or if I agree." "I see why Pluto shouldn't be a planet but its just so sad because when I was in like first grade it was a planet. Then they took it away. Like taking a cookie away from a hungry college student." "Pluto is one of the many frozen bodies around the Kuiper belt. It has not met the criteria to be a planet. To be considered a planet it needs to clear the debris from its original neighborhood." "I disagree because I have taken three weeks of an astronomy class and therefore do not feel qualified to argue with astronomers. They are probably right." "Thanks for the explanation to why Pluto isn't a planet." 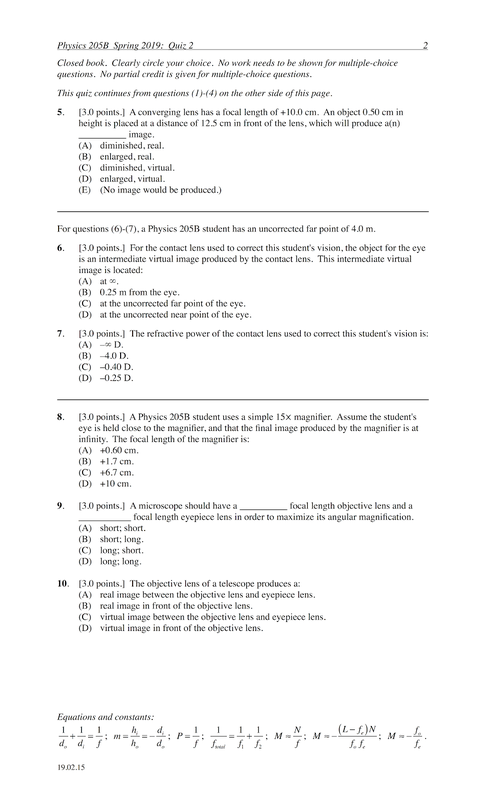 The following questions were asked on reading textbook chapters and previewing presentations on diffraction. "Diffraction is the bending of waves around obstacles or the edges of an opening. Huygens' principle states every point on a wave front acts as a source of tiny wavelets that move forward with the same speed as the wave; the wave front at a later instant is the surface that is tangent to the wavelets. 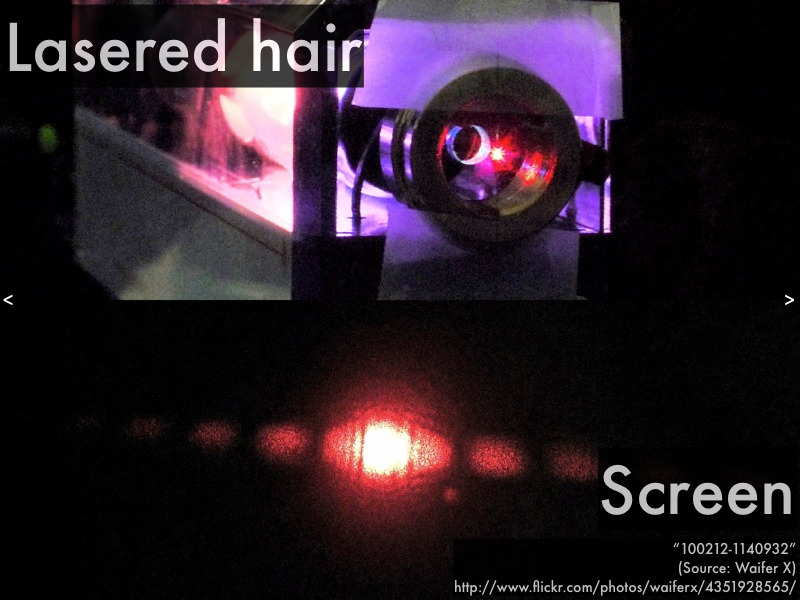 Dark fringes for single slit diffraction sinθ = m⋅((wavelength λ)/(width of slit W)) where m = 1, 2, 3, ..."
"Through a smaller diameter aperture, light detracts and spreads more, resulting in a less resolved image. A larger diameter aperture, light diffracts and spreads less, resulting in a more defined image." "Light passing through one slit will have diffraction in which the waves spread out past the slit. The wider the slit, the smaller angle of diffraction, and the smaller the slit, the bigger angle. Single-slit wave diffraction can be demonstrated using three variables: the slit width (W), the spread angle (θ), and the wavelength (%lambda;). The diffraction minima equation relates the width and the spread angle to the wavelength, accounting for the initial hose example." "I understand the concept that if the width, W, is wider, the half-angle will be smaller, and if the W is smaller, then the half-angle will be wider. The analogy of the graden hose is very helpful." That the single slit width W has an inverse relationship with the spread angle. As width increases, spread angle decreases, and vice versa." "I understood why a smaller value for width caused more diffraction because width is in the denominator, however I don't quite understand how the light bends around objects like a slit." "This reading didn't present much I didn't understand. The concept seems relatively straightforward." "I was just a little confused about the equations mentioned and how to use them and what they're used for." "Why would the θ of diffraction get bigger as W gets smaller?" "What I don't understand is why the spread angle gets smaller when the width gets larger. It seems to me like it would be the other way around." "I got a bit lost in the how increasing/decreasing the width making the spread angle decrease/increase. It just seems sort of backwards to what I thought it would be." "I don't understand the difference between angle spread and diffraction minima." "The equations and diagrams seemed a bit confusing. Examples and equation walkthroughs in class would be helpful." "I didn't understand the difference between the central bright fringe and the dark fringes. I also need to better understand how to find the central bright fringe (the dark fringe is the formula presented in the book and online lecture)." "Excited to do excellently on the quiz tomorrow!" "How we can infer so much about planets by assuming their similarities to (and differences from) Earth." "That we can learn so much about other planets through the history of our planet and we can learn so much about our planet by observing other planets. This is interesting to me because it is nice to see how much we can accurately infer about planets without having been there." "Learning about how many different variables need to be right for Earth to be so perfect for life." "I enjoyed the fact that the Turkey/Cornish Hen effect is applied to this chapter, it helps make things more memorable." "That the oceans or whatever water was on Venus that could be used to control the greenhouse gasses in the atmosphere all evaporated because of Venus' closer proximity to the sun. I knew that the water on Venus had evaporated i never really knew why though." "That Venus' volcanic activity is somewhat 'simultaneous' that its volcanoes all erupt at once when enough pressure builds up." "Learning about the composition of Mars' atmosphere was interesting to me because of the potential for life sustainability and water flow in its younger years of existence." "How big Mars' volcanoes are. I always pictured mars flat with small little hill-like bumps." 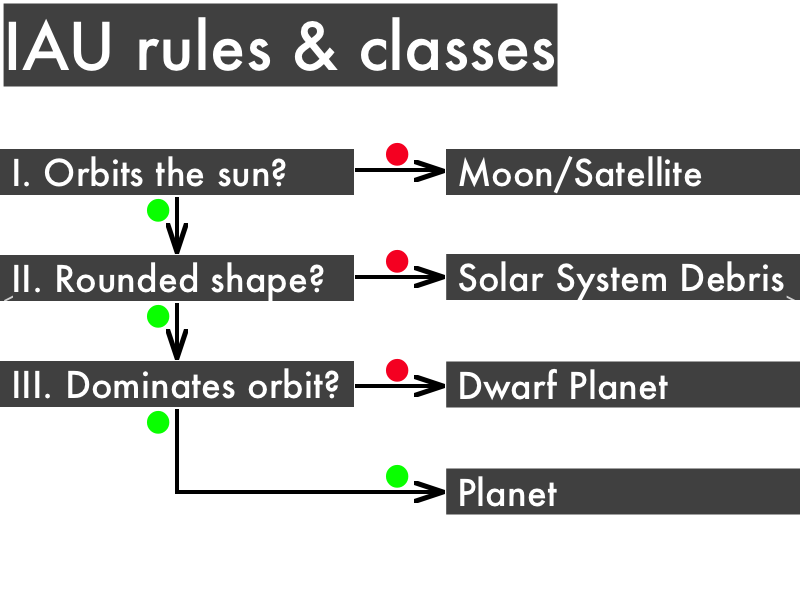 "The basis for classifying planets because it is based only on the three International Astronomical Union classification questions. The only way something can be classified as a planet is to answer 'yes' to all three questions." "Learning why Pluto isn't considered a planet was interesting because I didn't know the factors required to determine what a planet is." "How to remember all the atmosphere information for all the planets." "I'm still a bit confused on greenhouse gases and how Venus and Mars got out of hand." "Why Venus would be so hard to live on because Venus and Earth have the same mass." "Comparing the temperatures of the internal cores was difficult to understand when comparing the jovian planets. I was unsure if core temperatures had any major roles in determining weather activity. " "I cannot think of something I found confusing." "Because it was a planet before and they are already thinking of making it back into a planet." "It became a dwarf planet therefore it is no longer big enough to be considered an object of great mass known as 'planet.'" "I think that it doesn’t make much of a difference, but it was a sad day for Pluto." "Although disappointing to hear, the system used to determine planets does correctly identify pluto as a dwarf rather than a normal planet, as its gravitational influence does not dominate its surrounding area." "No Pluto should not be a planet because it is a separate category than the other planets and it is very small." "It was growing up for me and I don't see any reason it should not be i mean if the moon was orbating the sun I think we would consider it a planet." "They put so many requirements for what should be a planet, but I feel that those requirements don't essentially disqualify the planet Pluto. It's a sphere, has an orbit, its own moons." "Not for scientifically purposes but because it once was a planet and then they took that away from it. I feel bad for Pluto." "I'm not sure because Pluto has moons and orbits the sun just like other planets but at the same time it isn't large enough to be qualified as a planet. I'll probably just agree with smart scientists because they know what they're talking about and I really don't." "I grew up with Pulto being a planet but the world of science is ever evolving and changing. Therefore, if Pluto is not a planet based on criteria, then it's not." "Pluto got done dirty by everyone and deserves its rightful throne as a planet like it used to be." "At some point we have to have a cut off for bodies too small to be called planets." "It's weird growing up with pluto being a planet but it then not meeting the criteria one day. It almost makes you feel a little sorry for the planet. It was just trying best." "I'm do not have the expertise to say I am for or against." "I picked disagree, because Pluto doesn't dominate its orbit." "I don't care if Pluto is a planet or not the current accepted definition of a planet demands that Pluto is not a planet thus it is not if the definition of planet changes to include Pluto then i will consider Pluto to be a planet again." "Because it is a planet. when its not a planet its called 'dwarf planet'...the word 'planet' is in the name. were it is or isn't it will always be a planet"
"It's nothing like the planets around it so the definition doesn't fit." "Pluto doesn't meet any of the requirements that the rest of the jovian planets." "I feel like if it was considered a planet once before, it SHOULD be considered one today, but at the same time, I wouldn't be heartbroken if it never was renamed an official planet of our solar system, so I am strongly neutral on the subject." "Too small! Just another celestrial object orbitting the sun amongst a cluster of other objects. nothing special"
"Pluto does not dominate its orbit. Pluto's orbit is elliptical and there are times it comes closer to the sun then Neptune." "I'm kinda in between with Pluto being a planet, but I think they should decide and keep it that way, not switch it back an forth from planet to not a planet." "It is very small, and as data gathering methods improved we found many objects like it. Also Pluto's 'moon' is like the same size. So it can at best be considered a 'binary' planet :D"
"The reason Pluto shouldn't be a planet because it's small, invisible, and hard to see. " "Can Mars or Venus atmospheres be recreated in lab contained conditions here on Earth to test equipment?" 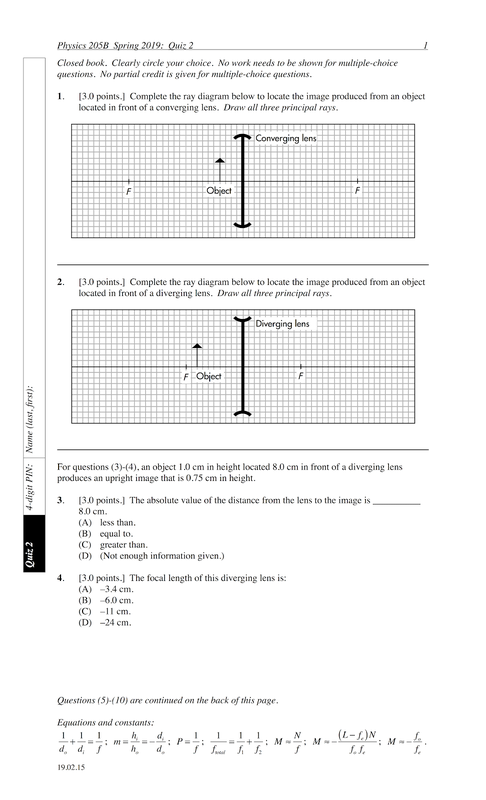 The following questions were asked on reading textbook chapters and previewing presentations on interference. "The principle of linear superposition, states that the resultant disturbance is the sum of the disturbances from the individual waves, which can be constructive or destructive interference." "Two waves combine when they arrive at the same point. They reinforce each other during constructive interference or cancel each other through destructive interference." "If two waves constructively interfere, their crests and troughs line up creating a bigger wave. In contrast, if two waves destructively interfere, the crests and troughs are contrary and they cancel out each other. Also whether two waves are constructive or destructive not only depends on the source phases of the waves, but also on the path length difference." "I like how visual this lecture was. It seemed much easier to comprehend seeing the waves and the differences in their peaks and troughs which then made it easier to understand that when they align they are constructive and when they do not they are destructive." "In phase sources result in constructive interference and out of phase sources result in destructive interference. For two in phase sources, if one wave travels a whole wavelength longer than the other, then constructive interference occurs; if instead one wave is a half wavelength longer than the other, then destructive interference occurs. Out of phase sources have an opposite result." "The mathematical equations regarding the conditions; I would like those to be explained in-depth." "The equations are confusing. Applying things to the diagrams needs more elaboration." "This section is pretty straightforward." "No questions today but I think I am going to like this section." "I think I understand this section but I feel like I'm missing something." "I need to better understand the source phase and path length differences. 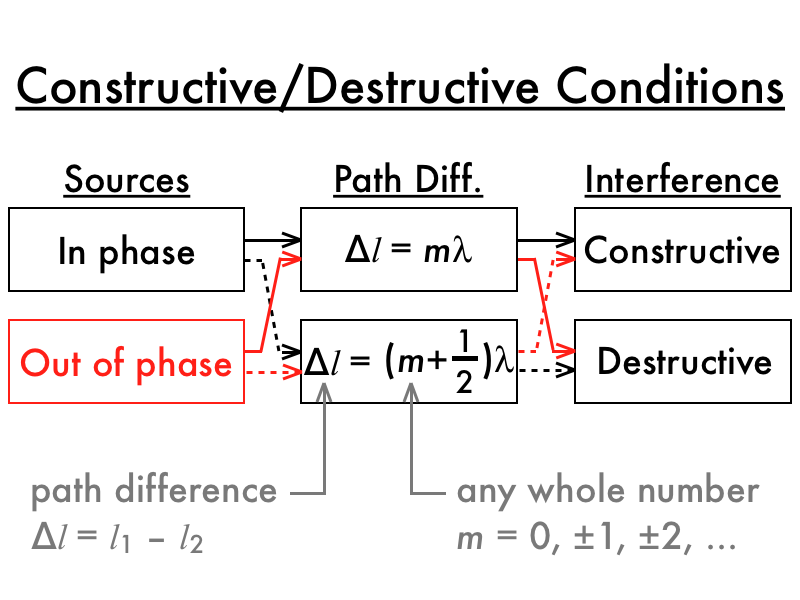 I will go over the presentation preview to better understand when a wave is considered to be constructive or destructive when the sources are out of phase." "Okay, it was going smoothly up until the in phase and out of phase questions." "I am not so sure about in phase vs out of phase sources so some clarification on that would be helpful." Astronomy quiz question: morning star Venus? The locations of Venus, Earth, and Mars are shown in the diagram below (not to scale, and orbits have been simplified as circles instead of ellipses). (D) not visible in the sky. If a line is drawn from Earth to the sun, the observer at sunrise (6 AM) is located perpendicular to that line. Everything below that line would be below the horizon, such that Venus will not be visible at sunrise. 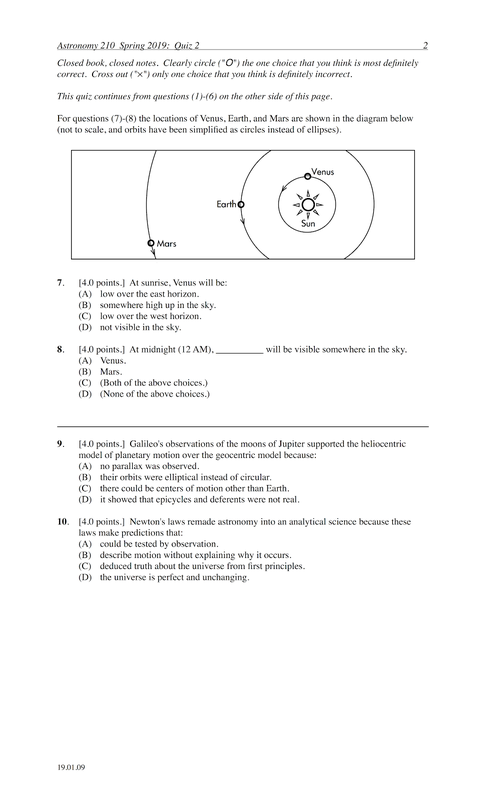 Astronomy quiz question: morning star Mars? Everything below that line would be below the horizon, such that Mars will be visible at sunrise, and be located low over the west horizon (the direction opposite from the sun rising from the east). Analysis of star brightnesses and temperatures in the region of globular cluster NGC 6752 revealed the presence of the __________ Bedin 1. Instruments aboard the International Space Station mapped the environment surrounding the black hole MAXI J1820+070 by detecting __________ originating from its corona. NASA's Mars Rover Curiosity used accelerometer and gyroscope data to measure the __________ of Mount Sharp's underground rock layers. "One thing I found interesting is why astronomers decide to place optical telescopes on mountains. I visited the Griffith Observatory in Los Angeles and wondered why it was on a mountain, now, I know its because the air is thin and transparent up there." "How Mauna Kea is essentially an outer space viewing Mecca." "The reason stars appear to twinkle is because of turbulence in the atmosphere. I had never actually considered the reason why before." "The twinkling of a star is actually caused from the atmosphere around Earth and that it doesn't 'twinkle' outside our atmosphere." "How much placing a telescope in space can differ from one placed on the ground." "How light pollution affects the view of the stars, which honestly is sad." "That light is reflected by particles in the atmosphere and washes out the stars, also the analogy of being underwater and looking up and how that distortion parallels turbulence in the atmosphere was particularly interesting to me because I am interesting in learning about light pollution and 'twinkling.'" "It was really cool to see the SOFIA plane in the text. A family member worked on that and was publishing a book about it before he passed away." "The inner four planets, Mercury, Venus, and Earth and Mars are small, dense worlds composed of rock and iron are known to be terrestrial planets. The outer four planets, Jupiter, Saturn, Uranus and Neptune are called the jovian planets because they have low-density materials." "I think it is really cool how the smaller planets are more dense than the bigger planets." "I can't seem to find where this was anymore but when I began reviewing this chapter I found a section on the theory of two planets colliding with each other and having the remnants form into the moon and Mercury, I thought that was interesting because of HOW COOL that is! PLANETS GO BOOM." "That the moon's core is smaller than expected and that mercury's core is larger than expected. This means that Mercury has a thinner crust." "It was really interesting to me learning about the greenhouse effect, especially because there are good and bad effects." "After reading about the Turkey/Cornish Hen effect, I was fascinated how simple it was to determine the cooling factor and/or speed of different planet cores." "I just need a little more clarification on how adaptive optics works." "How can disturbed air make you not be able to see, it's windy all the time and I can still see"
"What in the atmosphere exactly is causing this turbulence?" "The electromagnetic spectrum chart was very confusing. I don't understand how to read that or what it really means?" "I need more help in understanding how carbon dioxide enters the atmosphere. I read that carbon dioxide dissolves in water, but not clear on how it enters." "I understand that volcanos release carbon dioxide into the atmosphere and that carbon dioxide gets absorbed into the ocean, but how much is absorbed by plants? I was taught in school that plants produce oxygen and take in carbon dioxide, but I’ve never heard of the ocean taking in carbon dioxide." "Understanding the one-way function of greenhouse gases/material took longer for me to comprehend. It is just something that was hard to get when first reading the explanation, but the visual provided helped." "I didn't find that much confusing, just a lot to take in." "Because of disturbances in our atmosphere like wind and temperatures and densities." "As the star's light go through Earth's atmosphere it gets bounced around therefore causing the twinkling." "I don't have any today." "Could we watch more animations of collision theory and see more planets go BOOM?" "Please go over the presentation slides in class if there is time, because I learn mostly through listening!" "Thanks for being a cool teacher." "You are an awesome teacher!" "P-dog you are by far my favorite teacher. You make learning exciting and I thank you for that." "The objective lens is nearest to the object and the eyepiece (or magnifying glass) is nearest to the eye for both the microscope and telescope." "For a two-lens model of a microscope and a telescope, the object uses light from the object to create a real image that will become the object for the eye piece. For a microscope, since the object is close to the focal point, the image produced is highly enlarged. On a telescope, however, the object is going to be very distant and the ray tracing becomes parallel before it is focused by the objective." "The similarities between microscopes and telescopes: they both have tubes that hold two lenses apart from each other and have an objective lens in the front and an eyepiece in the back. The ray tracings are different, however." "The first image/second object produced by the objective for both a microscope and telescope is near the focal point of the eyepiece. Because it is near the focal point of the eyepiece, the light transmitted through the eyepiece is nearly parallel. The final image produced is enlarged, virtual and near infinity." 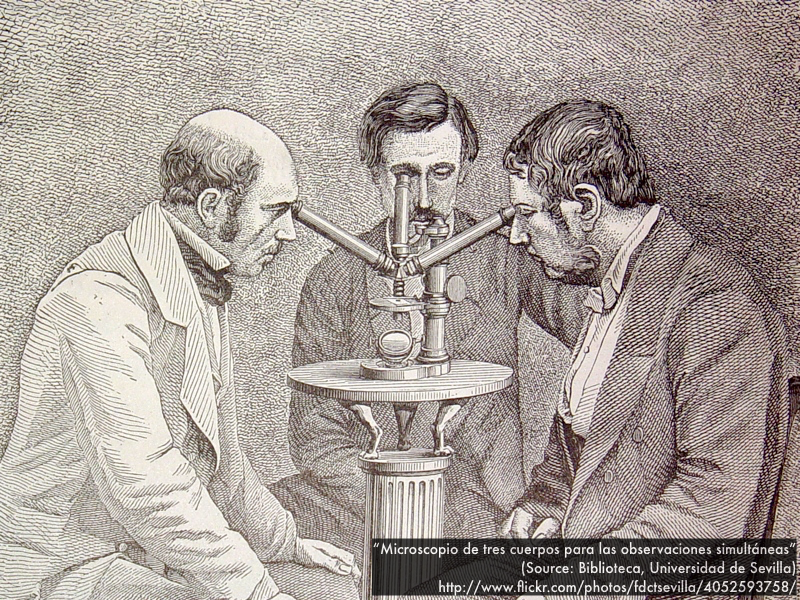 "Both a microscope and telescope consists of an objective and an eyepiece. Angular magnification of a compound microscope: the M is greater when fo and fe are as short as possible and when the distance between lenses, L, is large. angular magnification for telescope: the objective should have a long focal length and the eyepiece a short focal length." "I reviewed the lecture, but I still do not feel like I understand the difference between a microscope and telescope. I know the first object is a different distance from the objective and the image it creates is around the focal point of the eyepiece. But what are the lenses (or focal points?) doing differently?" "I am not sure what type of focal lengths you would want for an objective lens for a microscope or telescope. I am not sure type of focal lengths I would want for the microscope and the telescope." 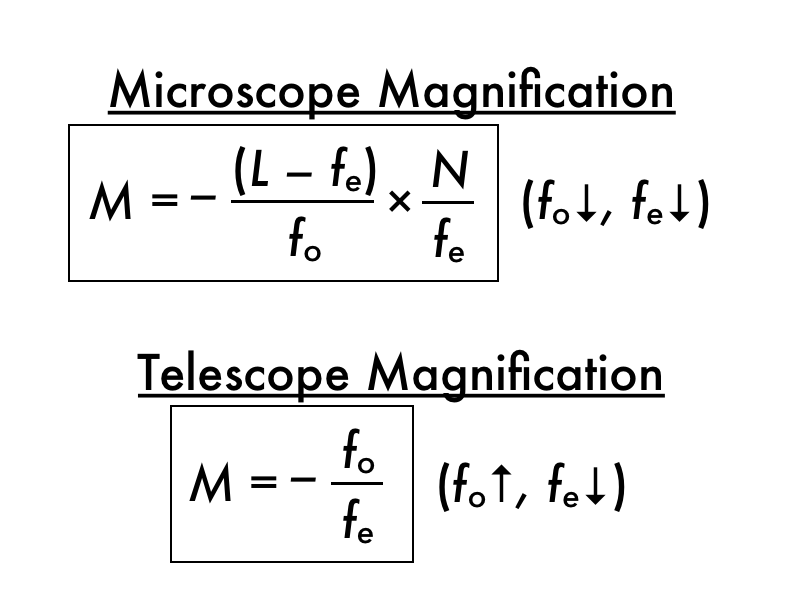 "The differences between the telescope and microscope magnification equations. Possibly it is due to the objects being placed at different focal lengths but I am not sure. To me it seems like both instruments essentially do the same thing so their magnification equations shouldn't be different." "The ray tracings for the telescope and microscope. Also how the ray tracings for both are so similar." 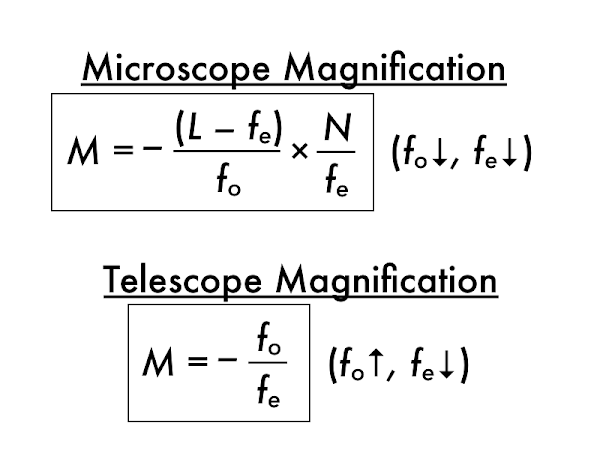 "Why the formulas for the magnification equations of microscopes and telescopes differ." "I'm a little confused because now we have two objects and two lenses involved in our ray tracings." "When I read the readings I will know what I know, but I will also know what I do not know and that will go here." 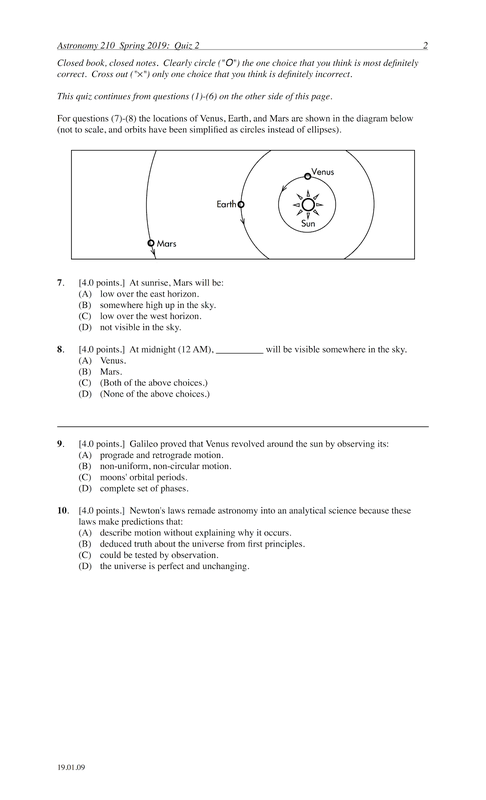 "I really struggle with these sections and am not 100% sure what I'm confused on. Talking it out with examples in class always helps, but working on this section at home is a struggle for me." "Could you review a little more about the angular magnification in class? I am still struggling with that a little bit." "No questions today but I am still a little confused on the magnification equations for both instruments." "What does it mean when an image 'goes out into infinity?'"